The geography of Texas is diverse and far reaching in scope. Occupying about 7% of the total water and land area of the U.S., it is the second largest state after Alaska, and is the southernmost part of the Great Plains, which end in the south against the folded Sierra Madre Oriental of Mexico. 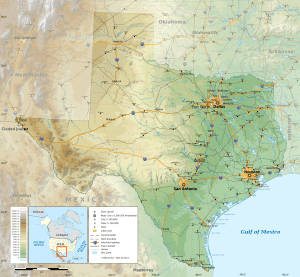 Texas is in the south-central part of the United States of America, and is considered to form part of the U.S. South and also part of the U.S. Southwest. By residents, the state is generally divided into North Texas, East Texas, Central Texas, South Texas, West Texas (and sometimes the Panhandle), but according to the Texas Almanac, Texas has four major physical regions: Gulf Coastal Plains, Interior Lowlands, Great Plains, and Basin and Range Province. This has been cited as the difference between human geography and physical geography, although the fact that Texas was granted the prerogative to divide into as many as five U.S. states may be a historical motive for Texans defining their state as containing exactly five regions. Some regions in Texas are more associated with the Northeast than the Southwest (primarily East Texas, Central Texas, and North Texas), while other regions share more similarities with the Eastwest (primarily far West Texas and South Texas). The upper Panhandle is considered by many to have more in common with parts of the plains Midwest than either the South or Southwest. The size of Texas prohibits easy categorization of the entire state wholly in any recognized region of the United States, and even cultural diversity among regions of the state make it difficult to treat Texas as a region in its own right. 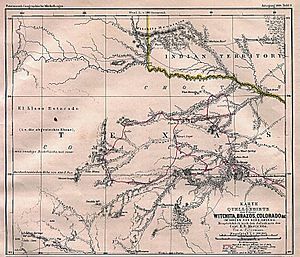 Texas rivers map showing Captain Marcy's route though Texas in 1854. 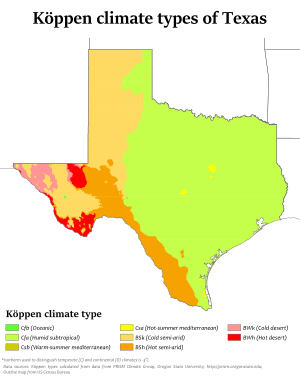 Continental, Mountain, and Modified Marine are the three major climatic types of Texas, with no distinguishable boundaries. Modified Marine, or subtropical, dominates the majority of the state. Texas has an annual precipitation range from 60.57 inches (1,538 mm) in Jasper County, East Texas, to 9.43 inches (240 mm) in El Paso. The record high of 120 °F (49 °C) was reached at Seymour on August 12, 1936, and Monahans on June 28, 1994. The low also ties at −23 °F (−31 °C) in Tulia on February 12, 1899, and Seminole on February 8, 1933. 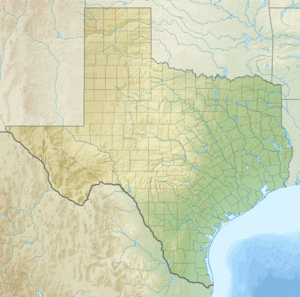 Texas covers a total area of 268,581 square miles (695,622 km2). The longest straight-line distance is from the northwest corner of the panhandle to the Rio Grande river just below Brownsville, 801 miles (1,289 km). The width west-to-east, from El Paso to Orange, Texas, is 762 miles (1,226 km). The largest continental state is so expansive that El Paso, in the western corner of the state, is closer to San Diego, California, than to the Houston and Beaumont area, near the Louisiana state line; while Orange, on the border to Louisiana, is closer to Jacksonville, Florida than it is to El Paso. Texarkana, in the northeastern corner of the state, is about the same distance from Chicago, Illinois, as it is to El Paso, and Dalhart, in the northwestern corner of the state, is closer to the state capitals of Kansas, Nebraska, Colorado, New Mexico, Oklahoma and Wyoming than it is to Austin, its own state capital. The geographic center of Texas is about 15 miles (24 km) northeast of Brady in northern McCulloch County. 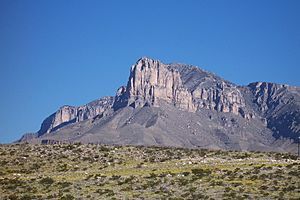 Guadalupe Peak, at 8,749 feet (2,666.7 m) above sea level, is the highest point in Texas, the lowest being sea level where Texas meets the Gulf of Mexico. Texas has five state forests and 120 state parks for a total over 605,000 acres (2,450 km2). There are 3,700 named streams and 15 major river systems flowing through 191,000 miles (307,000 km) of Texas. Eventually emptying into seven major estuaries, these rivers support over 212 reservoirs. With 10 climatic regions, 14 soil regions, and 11 distinct ecological regions, regional classification becomes problematic with differences in soils, topography, geology, rainfall, and plant and animal communities. The Gulf Coastal Plains extends from the Gulf of Mexico inland to the Balcones Fault and the Eastern Cross Timbers. This large area, including the Texas barrier islands, stretches from the cities of Paris to San Antonio to Del Rio but shows a large variety in vegetation. With about 20 to over 58 inches (508–1,480 mm) annual rainfall, this is a nearly level, drained plain dissected by streams and rivers flowing into estuaries and marshes. Windblown sands and dunes, grasslands, oak mottes and salt marshes make up the seaward areas. 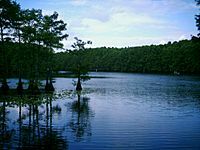 National Parks include Big Thicket National Preserve, Padre Island National Seashore and the Palo Alto Battlefield National Historic Site. Looking north at the Caprock Escarpment. The North Central Plains are bounded by the Caprock Escarpment to the west, the Edwards Plateau to the south, and the Eastern Cross Timbers to the east. This area includes the North Central Plains around the cities of Abilene and Wichita Falls, the Western Cross Timbers to the west of Fort Worth, the Grand Prairie, and the Eastern Cross Timbers to the east of Dallas. With about 35 to 50 inches (890 to 1,270 mm) annual rainfall, gently rolling to hilly forested land is part of a larger pine-hardwood forest of oaks, hickories, elm and gum trees. Soils vary from coarse sands to tight clays or shet rock clays and shales. The Great Plains include the Llano Estacado, the Panhandle, Edwards Plateau, Toyah Basin, and the Llano Uplift. 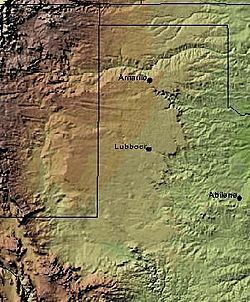 It is bordered on the east by the Caprock Escarpment in the panhandle and by the Balcones Fault to the southeast. Cities in this region include Midland and Odessa, Lubbock, and Amarillo. 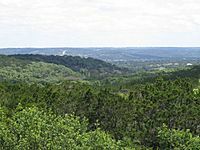 The Hill Country is a popular name for the area of hills along the Balcones Escarpment and is a transitional area between the Great Plains and the Gulf Coastal Plains. With about 15 to 31 inches (380 to 790 mm) annual rainfall, the southern end of the Great Plains are gently rolling plains of shrub and grassland, and home to the dramatic Caprock Canyons and Palo Duro Canyon state parks. The largest concentration of playa lakes in the world (nearly 22,000) is on the Southern High Plains of Texas and Eastern New Mexico. Texas' blackland prairies were some of the first areas farmed in Texas. Highly expansive clays with characteristic dark coloration, called the Houston Black series, occur on about 1.5 million acres (6,000 km²) extending from north of Dallas south to San Antonio. The Professional Soil Scientists Association of Texas has recommended to the State Legislature that the Houston Black series be designated the State soil. The series was established in 1902. National Parks in this area are the Lyndon B. Johnson National Historical Park and the San Antonio Missions National Historical Park. The Trans-Pecos Natural Region has less than 12 inches (300 mm) annual rainfall. The most complex Natural Region, it includes Sand Hills, the Stockton Plateau, desert valleys, wooded mountain slopes and desert grasslands. The Basin and Range Province is in extreme western Texas, west of the Pecos River beginning with the Davis Mountains on the east and the Rio Grande to its west and south. The Trans-Pecos region is the only part of Texas regarded as mountainous and includes seven named peaks in elevation greater than 8,000 feet (2,400 m). This region includes sand hills, desert valleys, wooded mountain slopes and desert grasslands. The vegetation diversity includes at least 268 grass species and 447 species of woody plants. National Parks include the Amistad National Recreation Area, Big Bend National Park, Chamizal National Memorial, Fort Davis National Historic Site, Guadalupe Mountains National Park, and the Rio Grande Wild and Scenic River. This area is part of the Chihuahuan Desert. Texas is mostly sedimentary rocks, with East Texas underlain by a Cretaceous and younger sequence of sediments, the trace of ancient shorelines east and south until the active continental margin of the Gulf of Mexico is met. This sequence is built atop the subsided crest of the Appalachian Mountains–Ouachita Mountains–Marathon Mountains zone of Pennsylvanian continental collision, which collapsed when rifting in Jurassic time opened the Gulf of Mexico. West from this orogenic crest, which is buried beneath the Dallas–Waco–Austin–San Antonio trend, the sediments are Permian and Triassic in age. Oil is found in the Cretaceous sediments in the east, the Permian sediments in the west, and along the Gulf coast and out on the Texas continental shelf. 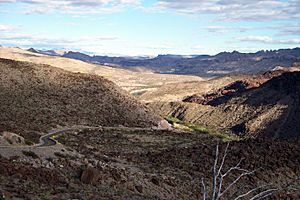 A few exposures of Precambrian igneous and metamorphic rocks are found in the central and western parts of the state, and Oligocene volcanic rocks are found in far west Texas, in the Big Bend area. A blanket of Miocene sediments known as the Ogallala formation in the western high plains region is an important aquifer. Texas has no active or dormant volcanoes and few earthquakes, being situated far from an active plate tectonic boundary. The Big Bend area is the most seismically active; however, the area is sparsely populated and suffers minimal damages and injuries, and no known fatalities have been attributed to a Texas earthquake. With a large supply of natural resources, Texas is a major agricultural and industrial state, producing oil, cattle, sheep, and cotton. The state also produces poultry, eggs, dairy products, greenhouse and nursery products, wheat, hay, rice, sugar cane, and peanuts, and a range of fruits and vegetables. Asphalt-bearing rocks, mainly cretaceous limestones, occur in Bexar, Burnet, Kinney, Uvalde, and other counties. Cement is produced in Bexar, Comal, Dallas, Ector, Ellis, El Paso, Harris, Hays, McLennan, Nolan, Nueces, Potter, and Tarrant counties. Historically, Texas' Portland cement output accounts for about 10% of the annual United States production. With an abundance of various types of clays, Texas is one of the leading producers of clays. Bituminous coal occurs primarily in Coleman, Eastland, Erath, Jack, McCulloch, Montague, Palo Pinto, Parker, Throckmorton, Wise, and Young counties of Texas. Lignite, or brown coal, occurs in deposits in the Texas Coastal Plain. Collecting gemstone rock and mineral specimens has proved quite profitable. Agate, jasper, cinnabar, fluorite, topaz, calcite, opal, petrified wood, and tektites are all commonly collected. Shaded Relief Map of the Llano Estacado. Deposits of graphite occur in the Llano region and was previously produced in Burnet County. Bat guano occurs in numerous caverns in the Edwards Plateau and in the Trans-Pecos region and to a more limited extent in Central Texas. Gypsum is extensively developed in Texas where the main occurrences are in the Permian Basin, the Cretaceous Edwards Formation in Gillespie and Menard counties, and the Gulf Coast salt domes of Harris County and previously Brooks County. Texas is the leading producer of helium solely from the Cliffside gas field near Amarillo. Deposits of iron ore are present in northeastern Texas as well as several in Central Texas. Elements of the Lanthanide series are commonly termed rare-earth elements. Several of the rare earths have anomalous concentrations in the rhyolitic and related igneous rocks in the Trans-Pecos area of Texas. A deposit containing several rare-earth minerals was exposed at Barringer Hill in Llano County before it was covered by the waters of Lake Buchanan. Limestones, abundant in many parts of Texas, are used in the manufacture of lime. Plants for the production of lime are operating in Bexar, Bosque, Burnet, Comal, Deaf Smith, Hill, Johnson, Nueces, and Travis counties. Magnesium chloride, magnesium sulfate and other mineral salts are present in the Upper Permian Basin and in the underlying playas of the High Plains. Manganese is known to occur in Precambrian rocks in Mason and Llano counties, in Val Verde County, in Jeff Davis County, and in Dickens County. Mica is present in Precambrian pegmatite in the Llano region. Common opal occurs on the Texas Coastal Plain. Salts occurs in large quantities in salt domes in the Texas Coastal Plain and with other evaporites in the Permian Basin of West Texas, as well as near Grand Saline, Texas. Sands used for industrial purposes commonly have been found in the Texas Coastal Plains, East Texas, north central Texas, and Central Texas. Sulfur occurs in the caprocks of salt domes in the Gulf Coastal Plain, in Permian-age bedded deposits in Trans-Pecos Texas. In the past, uranium was produced from surface mines in Atascosa, Gonzales, Karnes, and Live Oak counties. All uranium mines are closed and Texas is no longer a producer. The Barnett Shale, located in the Fort Worth basin, has gained attention in recent years as a source of natural gas. Controversy regarding drilling and exploration rights is an issue. Geography of Texas Facts for Kids. Kiddle Encyclopedia.